Rats are one of the most bothersome pests. They spread disease, such as rabies, ratbite fever, hantavirus and food poisoning. They contaminate food and living areas with their urine, droppings and hair. They can often cause significant damage to structures stored goods and wiring because they can gnaw through wood, plaster, plastic and soft metals. Rats will also bite sleeping children who may have food on their hands or face if they did not wash up before going to bed. 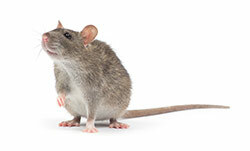 The most common rodent pests are the Norway rat. The Norway rat is common near sources of water. In fact, they must have water daily in order to survive. They thrive particularly well in areas where garbage is not properly stored. Because they are burrowers, they often dig in rubbish and under buildings or concrete slabs, causing damage to the foundations of buildings or blocking sewer lines. Norway rats will be active within 50-150 feet of their nests which are often in burrows along foundation walls. They are most active on the lower floors of a building unless there is a large population. They can enter a building through an opening of just 1/2 inch. They prefer food that is high in protein or carbohydrates but will eat almost anything. Garbage provides them with a well balanced diet. Norway rats are reddish-brown and heavy-set with a blunt muzzle. The tail is about as long as the combined head and body. Adults weigh 3/4 to 1 pound. Their droppings are 3/4 inches long and capsule-shaped. They have 8-12 young per litter and up to 7 litters per year.